Dockery as Matthew and Mary. 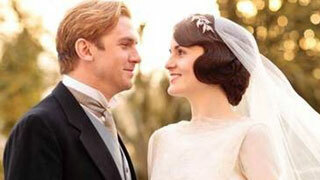 If you've wondered what's happened to Dan Stevens, who broke all our hearts when he decided to leave Downton Abbey a couple of years ago, here's the scoop! The 31 year old actor has been keeping himself very busy this side of the pond, having moved to New York City even before we saw the death of his character, Matthew Crawley, in a shocker of a car crash at the very end of the third season. We weren't the only ones to have been taken off guard by the demise of Matthew: Stevens and the rest of the cast were also kept in the dark. 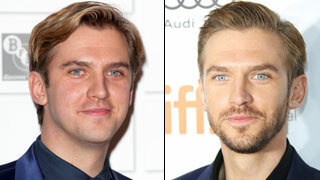 Dan Stevens on the Upper East Side of Manhattan. Stevens ended up coming to New York to play the lead in The Heiress on Broadway and stayed. Home now for Stevens and his family, which includes his wife, South African jazz singer Suzie Harriet and their two young children, is Brooklyn Heights. Brooklyn is also the setting for A Walk Among The Tombstones, another recently opened film Stephens stars in and in which he plays a drug trafficker. The film also stars Liam Neeson. The former Downton good guy is also in an episode of an online short film series called High Maintenance. In it he plays a stay-at-home dad with a side-line as a Brooklyn drug-dealer who has writer's block and wears women's clothes. Yes, quite the departure from solid as a rock, three-piece-suited Matthew! Before and after his weight loss. So too is the role Stevens plays in another recently released film; The Guest, in which he portrays a homicidal maniac with a Southern drawl! Not only did Stevens have to master the accent, he also had to bulk-up. It turns out that when Stephens was written out of Downton for good, along with losing the chance to return, he also lost a lot of weight. His role in A Walk Among the Tombstones further increased his desire to see the pounds drop off as it required his character to be super-skinny. So by the time it came to make The Guest he had to take to the gym and begin a course of martial arts training in order to obtain the physique of the character he was to play: an ex-soldier. Stevens has remained gluten and dairy free and has so far managed to keep the pounds off. Stevens will also be seen this holiday season in Night At The Museum: Secret of the Tomb. The film opens December 19th and in it he plays "Sir Launcelot"; a knight in shining armor who comes to life. Now if only Matthew could do the same! If there's someone you'd like to find out more about who appears in an Afternoon Tea show, drop me a line.